Washington DC’s medical marijuana industry is off to a slow start, with surprisingly low patient numbers, minimal participation by doctors and stringent regulations causing headaches for the first crop of dispensaries. To cope with the difficult climate, dispensaries are focusing on one-on-one client engagement, community involvement and in-house advocacy. Rabbi Jeffrey Kahn – owner Takoma Wellness Center, one of DC’s three dispensaries – said the current climate requires dispensaries to take an extremely hands-on approach with potential patients. The city is home to only a few dozen registered patients, and each can only purchase from their designated center, so the competition is stiff. To help woo potential customers, Kahn purchased a sponsorship to the upcoming AIDS Walk Washington event, where he will be handing out donuts, cups of apple cider and pamphlets on the benefits of medicinal marijuana. Like other dispensaries, Kahn offers a rewards program, with patients able to redeem points for marijuana and smoking accessories, as well as acupuncture and massage services with a partnering wellness business. But the city’s dispensaries take patient relations a giant step further as well, acting as brick-and-mortar advocacy and education centers. Takoma’s print ads invite potential customers into the dispensary, where Kahn and his employees will talk them through the application process. The businesses even pay potential patients’ government registration fees and take the official head shot photographs they must submit with each application. Otherwise, Kahn said his business operates similarly to legal dispensaries in other areas of the country, only at a much smaller scale. Takoma only sells dried marijuana flowers; it does not carry edibles, hashish or other TCH products because authorities have yet to license a D.C-area medical marijuana kitchens. The shop carries just four strains: OG Kush, Master Kush, Blue Dream and Jack Herer, and prices range from $380 (Blue Dream) to $440 (Jack Herer) an ounce, and $18 to $25 a gram. He’s hopeful that the shop will carry bubble hash and keef within a few months. Kahn said so far, inventory management has not been an issue. The DC dispensaries have adopted marketing strategies not unlike businesses in other states. Local regulations restrict the signage they can display outside their stores. Print advertising is popular, Kahn said, and Washington DC’s alternative weekly newspaper, The Washington City Paper, carries most of the dispensary ads. Kahn believes business will pick up once more patients realize the value of medicinal marijuana; however, he does not know when his dispensary will become profitable. 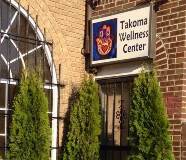 Takoma opened in August, and Kahn said he initially hoped to have 200 patients by the end of 2013. Currently he has just 24 patients. The city’s other two dispensaries are have similarly low customer numbers, reflecting larger challenges with the DC program. Only 59 patients have been approved for licenses since the city began accepting applications for MMJ cards. While the city government gave approval for four dispensaries and six cultivation centers, only three dispensaries and one cultivation center are in operation. The dispensaries now in operation are losing cash, having planned for a much larger patient base. Advocates believe the city’s stringent regulations and the fear of prosecution by the DEA are to blame for the slow growth. Medicinal marijuana is approved to treat just a handful of illnesses in Washington DC: HIV/AIDS, glaucoma, cancer and multiple sclerosis and other ailments that create persistent muscle spasms. The patient application process is too confusing, advocates said. Only 62 physicians have requested the paperwork that is required to prescribe marijuana. And should the market expand, growers and dispensaries will be hamstrung by other rules, including one that limits cultivation to just 95 plants per dispensary.